Ditching the summer heat calls for a plan to hit up a fun water park, and Noida. in its midst, has one of the most popular ones. The Worlds of Wonder amusement park has a thriving, water park section that is worth a visit for its awesome rides and its plethora of weekend events. 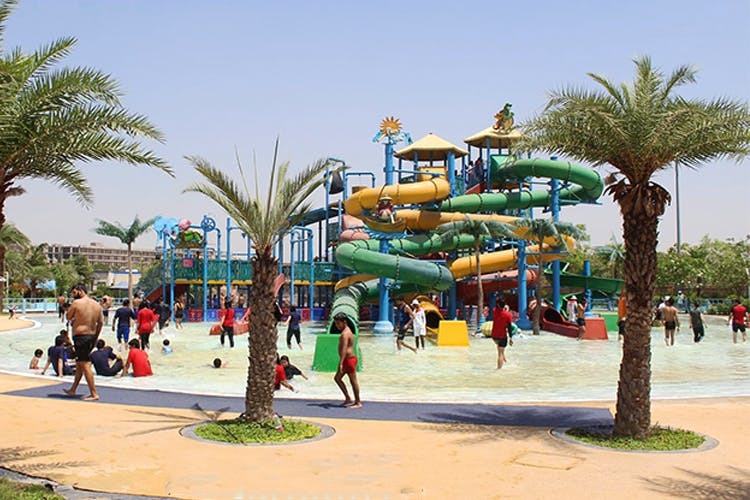 This water park has plenty of rides for adults and kids alike, including a free-fall, a lazy river, a rain dance, their Raft Ride (which allows a group to slide down a raft together), Little Splash (which the kids will love) and more. Adrenaline junkies should head straight to the star rides, the Rapid Racer and the Turbo Tunnel. They look like the typical water slides, except that you go in head-first. At all times, trained lifeguards will be there to make sure nothing goes south. They also have a wave pool, which doubles as the hub for all the exciting events they keep hosting (mostly on weekends). You can keep track of any new ones here. For when you’ve worked up an appetite, you can pop by their dining options – Cafe WOW near the entrance gate for sandwiches, shakes and ice-cream, the Punjabi dhaba for some quintessential North-Indian, and their snack bar, pool bar and multiple kiosks to grab a quick bite. The price of a ticket for the water park is INR 1,098 for weekdays, and INR 1,299 on weekends (for adults). They also run regular discounts and offers, which you can find out all about here. You can even avoid the long lines, and make a booking beforehand here.